With the premiere of Bringing Up Bates season four only three days away, let's look back at the first three seasons. Season one of the series kicked off on New Year's Day 2015 and showed footage from prior to oldest grandchild Bradley Bates' birth. "It’s not about me. It’s really about friendship…making the other person feel special and important. And I want Whitney to feel special and important because I really am happy for her." At the end of the pilot episode, Alyssa and John made a baby announcement of their own. 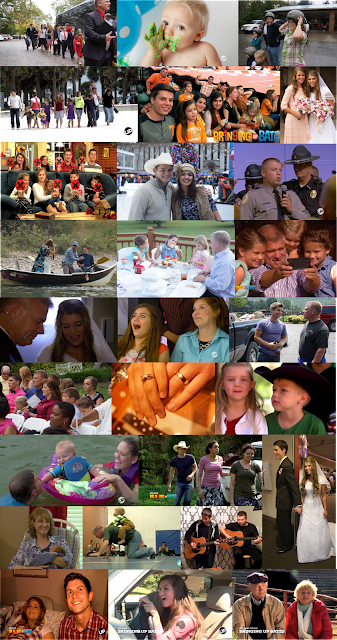 The series continued for more than 40 episodes, highlighting the most memorable milestones of Gil and Kelly Bates and their 19 children, four in-laws, and three (soon to be five) grandchildren. Man, it is so hard to pick a single moment. From the interviews, I love anything with Callie, Ellie and Addallee, especially when Callie either tries to get her comment in, or starts punching the older girls or messing their dresses, or whatever. I just laugh so hard. The "Time Outs" with Judson and Jeb were personal favorites of mine - unfortunately, those parts are not in the VOD on either Amazon or iTunes. As far as episodes, there were so many fun ones - the Bates in Florida and the little girls freaking out when they drove into the swamp, Michael surprising Brandon in Texas (actually, I just love anything with Brandon - he wears his heart on his sleeve), Lawson singing at the children's hospital, when Tori gets her purity ring (I am actually surprised they don't do that earlier, but at least when they do it when they are older, it is a commitment made with more knowledge and thought), I loved Gil trying to loose weight and kept smuggling the sweet tea. Many other fun moments. And of course, there are the really memorable episodes, such as anything with Trace and Ashley, Brandon and Michael's engagement and wedding, the birth of Bradley and Carson. But I do have an all time favorite moment, and it just so happens to be the inspiration for the season 4 poster. My favorite Bates moment was Kelly on the roller coaster! I think I watched that scene a dozen times! And overall, that was my absolute favorite episode as well, "Hello, Dollywood"
When Michaela whispered to her dad right before she was escorted down the aisle: "Oh daddy, I'm so happy." Me again! Also when Gil took his 3 youngest daughters out to lunch. Loved their sweet comments & his reactions & responses. Season One playing football at Grand Pa Bates farm and watching all those married old men and big boys get schooled by Trace. Lets hear it for the few and fewer yet still free guys. When Carlin moved around the furniture in Michael and brandons house. A few days before Michael got married and Carlin said " we don't want you to leave" and "we're blaming Brandon for this"!! Also when the pool table came apart and they all yelled " Chad!!" Also when Carson was born. I cried so hard.